The Spherical Lesion Phantom Model 408 LE provides a unique way of testing resolution performance of ultrasound scanners. The Spherical Lesion Phantom contains 2 mm and 4 mm diameter tissue mimicking spherical lesions which lie in a single plane at the center of the phantom. Axial, lateral and elevational resolution are accounted for simultaneously and equally for all types of ultrasound systems and configurations. In the 2 mm section, there are 105 anechoic spheres at 0.5 cm depth intervals and in the 4 mm section there are 211 anechoic spheres at 0.75 cm depth intervals. section there are 211 anechoic spheres at 0.75 cm depth intervals. optimized for use with tissue harmonics imaging technology. more of the ultrasonic beam can be transmitted and received. the Precision Ultrasound Transducer Guide. Gammex 408 LE. Note the well defined 2 mm and 4 mm targets. Spherical Lesion Phantom Model 408 LE Ultrasound imagine quality in three dimensions: axial, lateral and elevational. 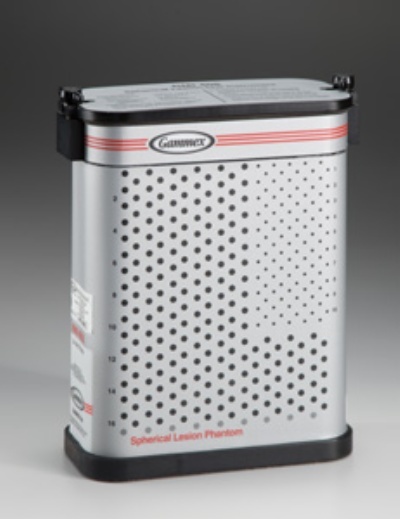 The Spherical Lesion Phantom Gammex 408 LE provides a unique way of testing resolution performance of ultrasound scanners. The Spherical Lesion Phantom contains 2 mm and 4 mm diameter tissue mimicking spherical lesions which lie in a single plane at the center of the phantom. Axial, lateral and elevational resolution are accounted for simultaneously and equally for all types of ultrasound systems and configurations. In the 2 mm section, there are 105 anechoic spheres at 0.5 cm depth intervals and in the 4 mm section there are 211 anechoic spheres at 0.75 cm depth intervals. The Spherical Lesion Phantom Gammex 408 LE incorporates our Tissue Mimicking (TM) gel which provides a smoother background texture than conventional tissue mimmicking gels. The Gammex gel allows production of lesions with negligible echogenicity while producing no distal enhancement or shadowing inherent with other gel forms. The TM gel is also optimized for use with tissue harmonics imaging technology. In addition, the Gammex 408 LE has a new composite film scanning surface that has improved transmission properties so more of the ultrasonic beam can be transmitted and received. Optional accessories for the Gammex line of Ultrasound phantoms include Soft Foam-Lined Carrying Case, Rigid Case, or the Precision Ultrasound Transducer Guide. The Model 406 LE Dual Attenuation Phantom gives you the benefit of having two phantoms in one with background attenuations of 0.5 and 0.7 dB/cm/MHz in a side-by-side configuration. Quality control tests over a wide range of frequencies can be performed quickly and easily, providing a comprehensive profile of the scanner¡¯s overall image quality ¨C all with a single phantom. The Precision Multi-Purpose Grey Scale Phantom Model 403GS LE offers new advanced technology for measuring the image quality of high resolution ultrasound systems. Grey scale targets are provided for monitoring contrast and temporal resolution, distinguishing different intensities of brightness and border delineation capabilities of the ultrasound system. The Gammex 403 LE has the same general target layout and specifications as the 403GS LE but does not include grey scale targets.